I've seen listed two 'sets' of pads for the front, either the 4pad or 8pad sets. Is there any way of telling what my car is supposed to have? I think it currently has a 4pad setup, but i'm not sure if this was put in by the previous owner, as the 8pad set looks to have the wear indicator tails on (4pad doesn't). And mine's been whinging about 'check brakes' for as long as i can remember. Do you know which type of brake caliper you have? I've got the 17" wheels and the 2FN calipers which use 334mm rotors and the four pad setup. Some cars have the HP2 calipers which use 321mm rotors and are the ones that use eight brake pads per wheel. "I've got more on my plate than a spinster at a wedding"
Rob, if you check the calipers on your car you should see 2FN stamped on them, if so it's the 4 pad setup required for your car. Cool looking discs, where did you get them? Have been thinking of changing my front discs but aftermarket discs are hard to find!! Malcolm, you'll be hard pushed to get replacement disc from anywhere other than from VW! I work in a motor factors and have been through all my suppliers catalogues looking for new discs and can't find anyone who supplies the correct size! They all seem to list 321mm as the correct size, I've contacted a few of them directly only to be told the discs are dealer part only! The pads on the other hand are the same as those used by Audi and BMW, if you want I'll send you a few part numbers for various aftermarket suppliers! Found the following specs according to their site. No front discs listed. Your only recourse i think is either dealer discs, or custom made. AFAIK the dealer discs are 202 each x vat, doing the math gives total price of 475 quid. 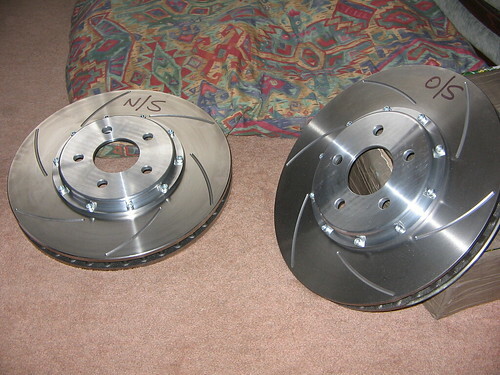 The discs i ordered were from http://www.godspeedbrakes.co.uk/ as recommended by Rob and Dave on here (thanks guys :) they cost me 510 inc delivery, they have the measurements on file, so they take about a week to make up. The advantage is the separate bell housing, which means in the future the discs will cost less to replace. My front pads were 4 per axle. I got Mintex ones (MDB1746). The VW part number is 3B7698151. I've been looking at brake discs and so far the only ones I can find that are 334mm diameter and 32mm thickness are ones for the BMW 750 (the E38 version). Would they fit okay or is there some VW special sauce for the OEM W8 discs? VW Passat spacing is 5 x 112. I was looking at the later Audi TT 3.2 2003-2006. Seems to have the same spec disks as W8 (334mm, 32mm, 5x112 spacing and 68mm hub dia) but 5 x 100. My calipers are 2FN 4 pad setup using Mintex MDB1746. Wear indicators from main dealer as Mintex supplied were too long. I also replaced the combined wear indicator/ABS loom as this had a fault. No more "check pads!". VW fitted several different front disk setups and the 2FN 334mm is for European sport models only. 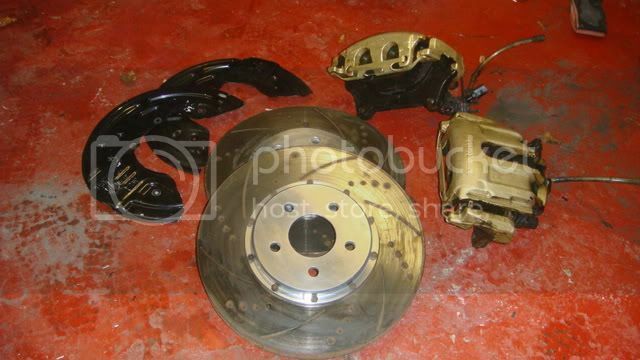 Main dealer price is £700 for the 2 disks and the pads are £150.00 a set ouch! Passat W8 Auto, Inky Blue, SatNav, Beige Leather, Sports suspension, solar roof, parking sensors, Nokia bluetooth. I pretty sure BMW wheels are 5x120. I dont think bolt pattern would be as much an issue, if you were perhaps thinking of running different wheels. Everything else being the right offset/spaced out properly, would be more of a concern first. ....HMMMM, now you got me thinking, as there are some OEM BMW wheels I really like & think would look cool on a VW/Passat. Swapping everything out, would save having to buy/use spacers/adapters, thus changing the offset of the wheels, & making wheels harder to fit. I wonder if this is at all possible (easily possible that is).